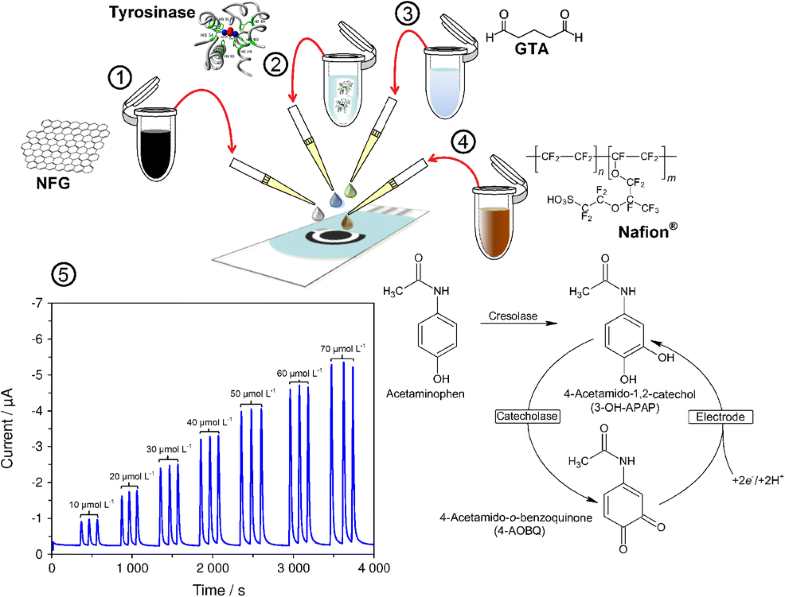 An amperometric biosensor compatible with a flow injection analysis (FIA) for highly selective determination of acetaminophen (APAP) in a sample of human urine was developed. This biosensor is also suitable for use in the routine pharmaceutical practice. To prove this statement, two different commercially available pharmaceutical formulations were analyzed. This nano-(bio)electroanalytical device was made from a commercially available screen-printed carbon electrode covered by a thin layer of non-functionalized graphene (NFG) as amperometric transducer. 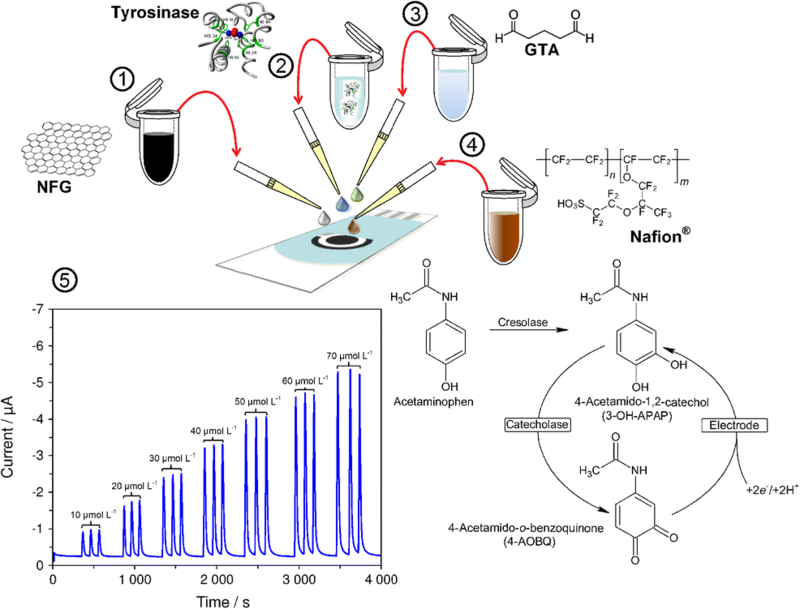 A biorecognition layer was prepared from mushroom (Agaricus bisporus) tyrosinase (EC 1.14.18.1) cross-linked using glutaraldehyde, where resulting aggregates were covered by Nafion®, a known ion exchange membrane. Owing to the use of tyrosinase and presence of NFG, the developed analytical instrument is able to measure even at potentials of 0 V. Linear ranges differ according to choice of detection potential, namely up to 130 μmol L−1 at 0 V, up to 90 μmol L−1 at −0.1 V, and up to 70 μmol L−1 at −0.15 V. The first mentioned linear range is described by the equation Ip [μA] = 0.236 − 0.1984c [μmol L−1] and correlation coefficient r = 0.9987; this equation was used to quantify the content of APAP in each sample. The limit of detection of APAP was estimated to be 1.1 μmol L−1. A recovery of 96.8% (c = 25 μmol L−1, n = 5 measurements) was calculated. 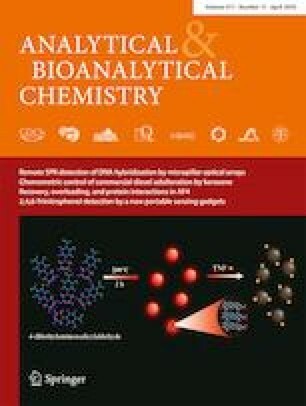 The obtained results show that FIA is a very selective method for APAP determination, being comparable to the chosen reference method of reversed-phase high-performance liquid chromatography. The online version of this article ( https://doi.org/10.1007/s00216-019-01687-4) contains supplementary material, which is available to authorized users. Financial support from Faculty of Chemical Technology, University of Pardubice (project No. SGS-2019-003) and CEEPUS CIII-CZ-0212-10-1617 network for mobility funding are gratefully acknowledged. The study was not aiming to investigate functions/diseases of the human body or a process of medical treatment; therefore, the administration of acetaminophen by the participant was not performed and the drug was used only for artificial spiking of commercial and the participant’s own urine sample. A healthy volunteer received a complete description of the study and gave written informed consent before providing the urine samples. The obtained sample of human urine was anonymized before the study. The ethical principles for medical research of the components of human beings have not been violated because no compounds other than acetaminophen (artificially enriched urine) were determined. Therefore, all experiments with human urine samples were done in accordance with the WMA Declaration of Helsinki, June 1964.